Looking for something to do on a Sunday afternoon? Hoping to entertain those out-of-town guests? Trying to get your steps in? Or are you interested in learning more about the buildings that you usually drive by? Well, look no further. Come and explore Newtown in a whole new way by taking one of our walking tours. Enjoy this self-guided tour which includes 34 historic markers that are walkable across Newtown Boro and Newtown Township. It also includes the History Detective Contest and is great fun for families! This self-guided tour of buildings in Newtown Borough and Newtown Township was originally written in 1961 and has been updated over the years. Take a self-guided tour of the places in Newtown that were present during the Revolutionary War. Learn the names of the Streets during that time and the reason for them being changed. 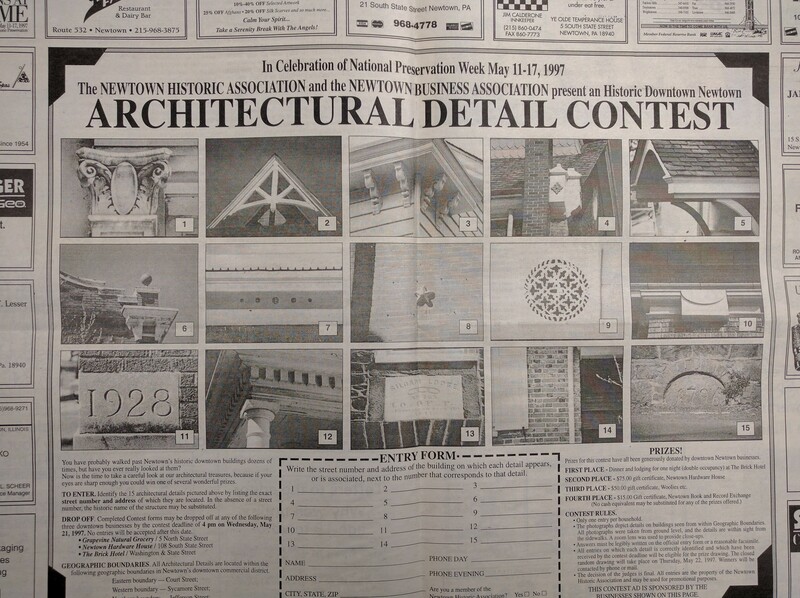 In 1997, the Newtown Historic Association and the Newtown Business Association jointly developed an “Architectural Detail Contest.” The contest was held in celebration of National Preservation Week, May 11-17, 1997. 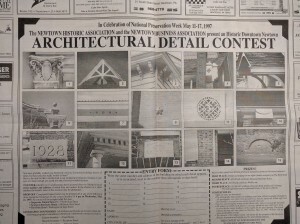 Fifteen close-up photos were printed in The Advance, along with an entry form, and the goal was to identify all of the buildings by their details. The first-place prize was “Dinner and lodging for one night (double occupancy) at The Brick Hotel.” You can see the original contest printing here. Watch this space for a new, updated twist on this contest — our Architectural Scavenger Hunt, coming soon! Every year in early June, children from the local schools take a walking tour of historic sites. The Newtown Historic Association has run this tour for over 30 years. This has proved to be a very popular event with the children and enables them to learn about their heritage and local government. See the NHA Events Calendar for information on the next edition of this tour. 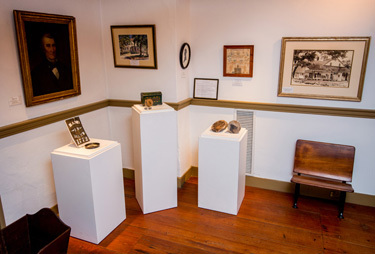 This tour is held annually and includes a range of themes to honor past Newtown residents and their accomplishments. Previous tours have highlighted interesting headstones and individual histories, Civil War soldiers, and Newtown business owners. Watch for the next tour on the NHA Events Calendar and come out and learn about those who have left their mark on Newtown.